Congratulations on your engagement! In many ways, planning your engagement party is a trial run for planning your wedding day. 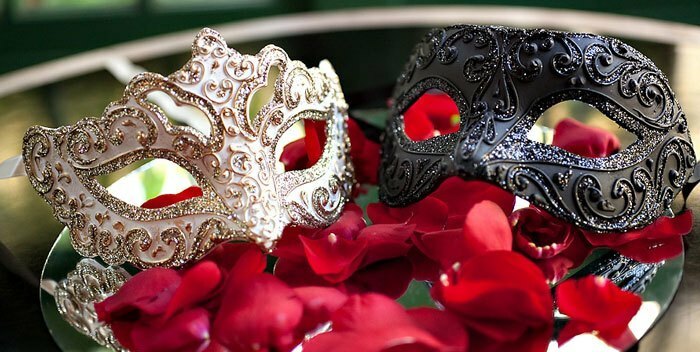 The same questions come up: there is a venue to find, decorations to choose and at least two families to consider when you plan the invitation list. 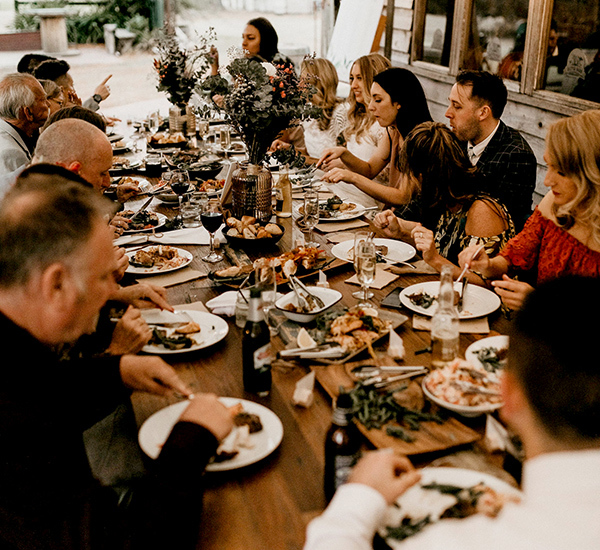 We might not be able to help you navigate your in-laws, but we can help remove some stress from your planning process with our special engagement party catering service in Melbourne. With incredible customisable menus, friendly and professional wait staff and experienced chefs, Going Gourmet catering is here to help. 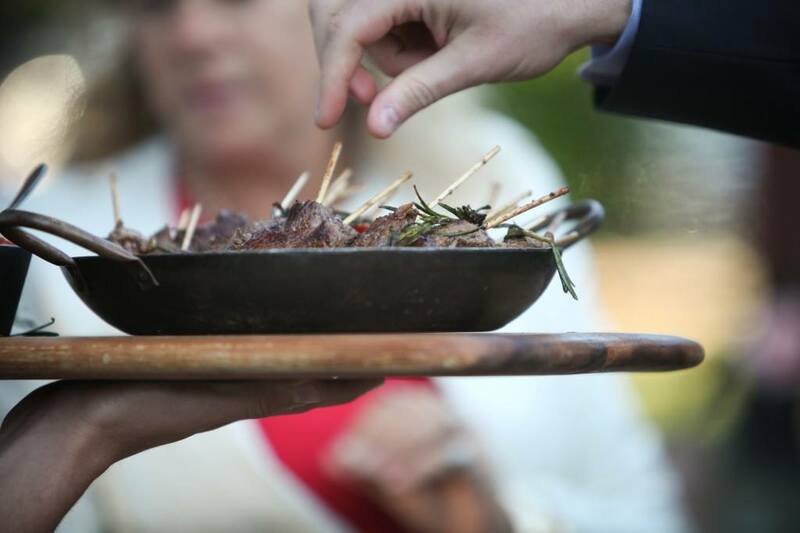 Going Gourmet offers a wide range of options, so you can tailor the catering to suit your event. We work closely with you to create a menu that reflects your tastes and dietary needs, and execute it using only the finest quality ingredients and local produce. At Going Gourmet, we take a lot of pride in creating menus that offer a diverse range of food to make sure there is something to suit everyone’s tastes. And don’t worry, we always make sure that there is enough food for everyone. 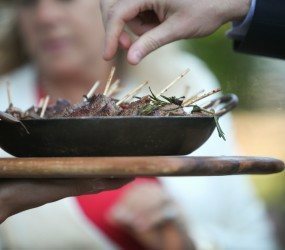 Every engagement party is unique, but whether you’re planning a BBQ, a sit-down dinner, a cocktail party, a buffet, or something else entirely, Going Gourmet can provide fresh, affordable catering that your guests are sure to enjoy. We understand that if there is something that is an allergy or dietary requirement, we create around it and never cease to amaze. 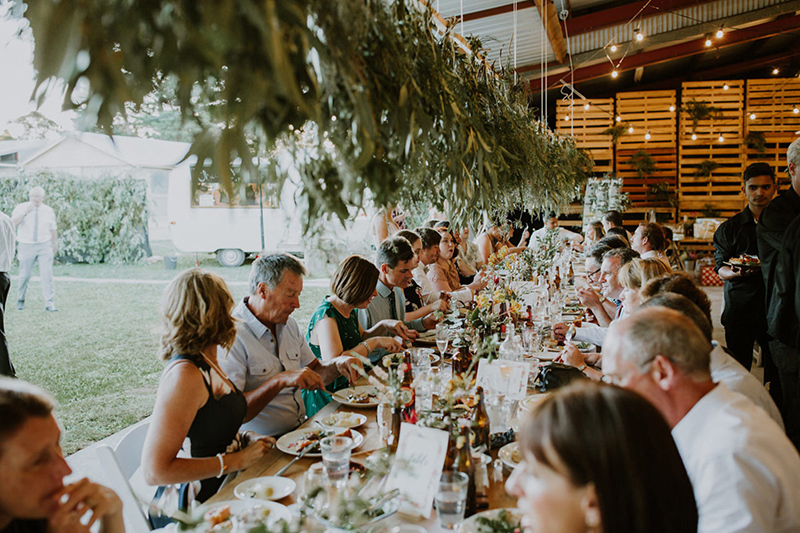 No matter where you choose to hold your engagement, we take the hassle out of catering and are very self-sufficient, meaning there’s no need for you to lift a finger. 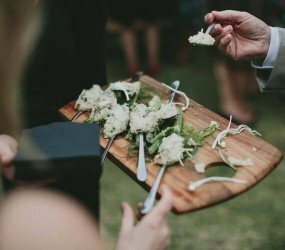 Contact our friendly team today on (03) 9543 8810 and take advantage of the best engagement party catering service available in Melbourne. Hosting a party and looking to treat your guests with some taste-bud tingling sensations? 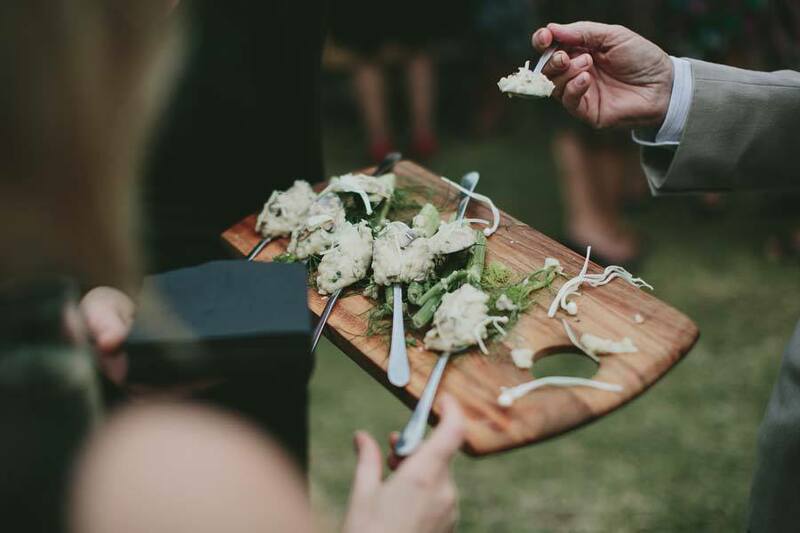 Going Gourmet is the only catering company you need to provide affordable, delicious finger food for any party throughout Melbourne and beyond. With extensive experience at weddings, birthdays, corporate functions and more, we have the skills to serve you with excellent treats in any situation. 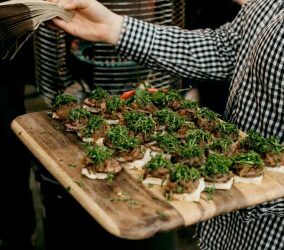 Canapé catering is the perfect choice for events and celebrations where your guests are mingling with one another and don’t need a full sit-down meal. 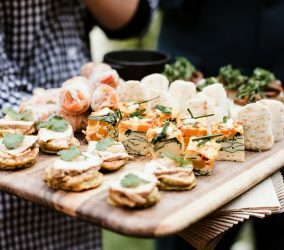 Canapés are particularly popular for events such as wedding receptions and cocktail parties where guests can pick at the food as they like over time, with fresh trays being brought out regularly. Thanks to their small size, finger food can be eaten quickly in the midst of a conversation while creating minimal mess so that everyone can continue socialising throughout the event. 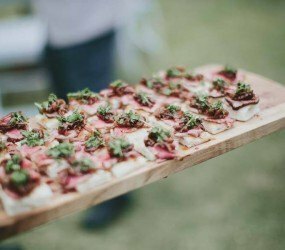 Going Gourmet is proud to offer fabulous party catering in Melbourne along with select inner country locations by special appointment. 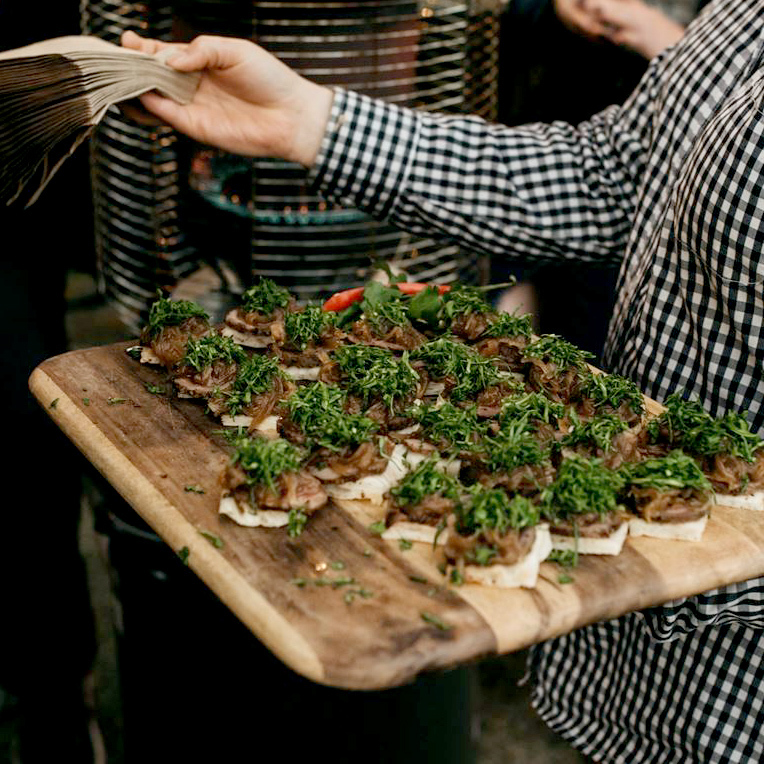 Our finger food catering goes beyond the standard party pies and sandwiches to deliver fascinating tiny dishes that showcase local produce and epicurean recipes in a single delightful bite. 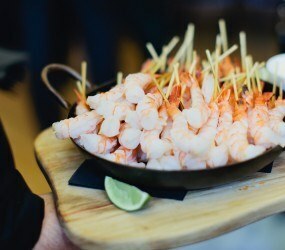 Our affordable cocktail party finger food catering service includes a fabulous chef to prepare the food and professional wait staff to make sure all your guests have a bite. The canapés are circled around the room systematically while our staff explain the sauces and garnishes. Enjoy great entertainment, great party food and an occasion to remember all rolled into one. 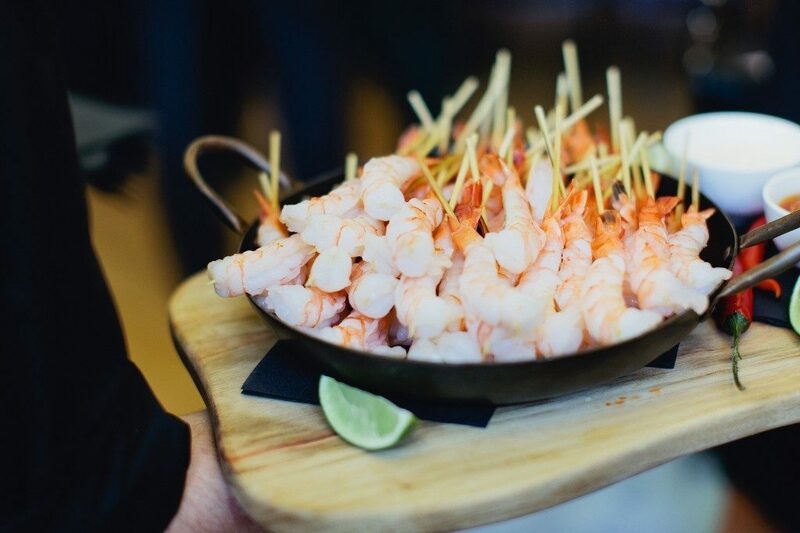 Explore the menus below for inspiration, view our testimonials and get in touch with us today to design your perfect function with finger food catering from Melbourne’s preferred company. Just call (03) 9543 8810. The perfect package for birthday celebrations or engagements! This Canape Package includes 8 Cool & Hot menu items, allowing for 10 pieces per person to ensure they are well looked after at the event. We always provide your own personal chef to cook and wait staff to serve the food around to all guests on our beautiful platters, chatting about the menu items and what they are. The menu can be customized, so get in touch today to chat to the Events Team about what you are after! This package is served over 2 hours and you can always add on some Cheese & Antipasto Platters or Petit Four Desserts to extend service. The Cocktail Experience package really is an “Experience”. 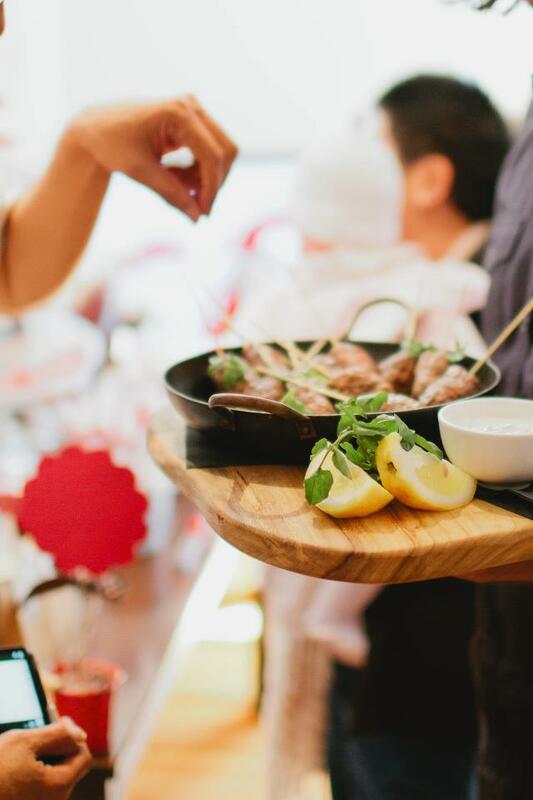 Our Chef will cook in front of you and your guests and you can experience the live display of fresh and plentiful canapés with cool, hot & then BBQ cooked options. This package is most suitable for weddings or events where you really want to impress. The Experience offers 3 hours of food service and 12 menu items in total – allowing for 15 pieces per person. You can always customize the menu to suit your preferences or dietary needs! 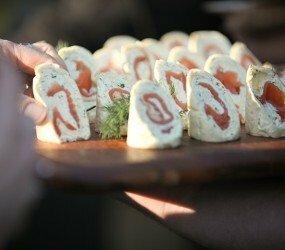 Canapés on arrival is a great way to tantalise your guests taste buds in preparation for the delicious meal to come. It showcases some of our best canapés and becomes a conversation starter as guests arrive. 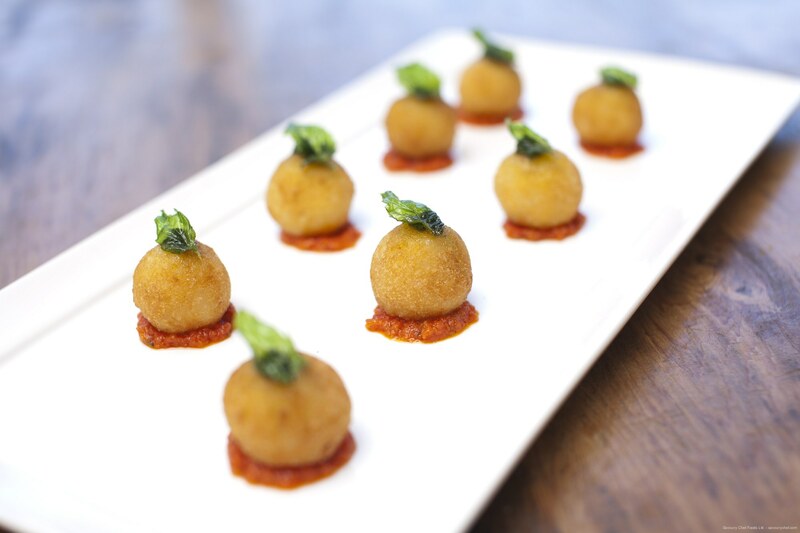 We offer the option of 5 canapés or 7 canapés. Starter packages are designed as an appetiser with a meal to follow in mind. 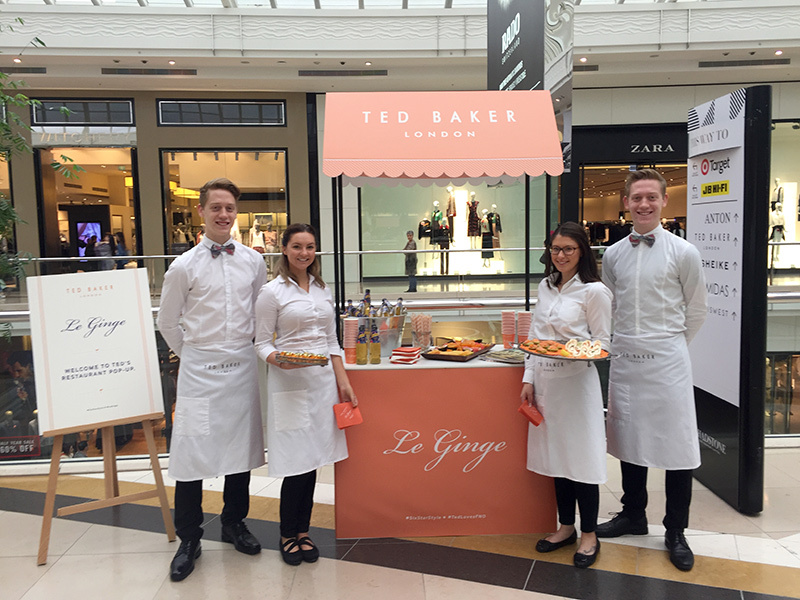 Pairing canapés with Main offers a fuller package to ensure everyone gets a taste of what we do. Whether you have a client meeting, business conference or anything else in between, it’s important to make the right impression. Being able to host a great function helps keep morale high above your own employees and demonstrate your success to potential clients. 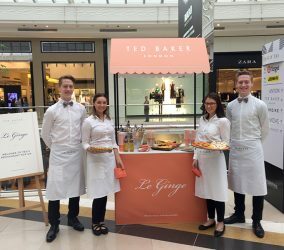 Over many years we have worked at countless events for a variety of clients including celebrities, iconic brands and high profile organisations. 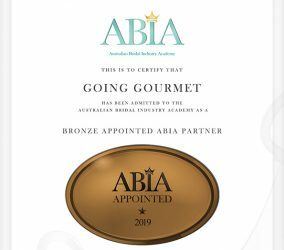 We have developed a reputation as the top corporate caterers in Melbourne for providing delicious food, innovative design, professional staff and peace of mind for our clients. From canapés and finger food to sit down meals and buffets, we can offer unrivalled catering for your business. We combine style, great taste and execute a luxurious experience at every function no matter the size or cater. Our team are highly organised in terms of planning for different venues, with or without commercial kitchen facilities. For example, we can provide office catering Melbourne wide, so you don’t even have to leave the premises to enjoy restaurant quality food with your colleagues/clients. 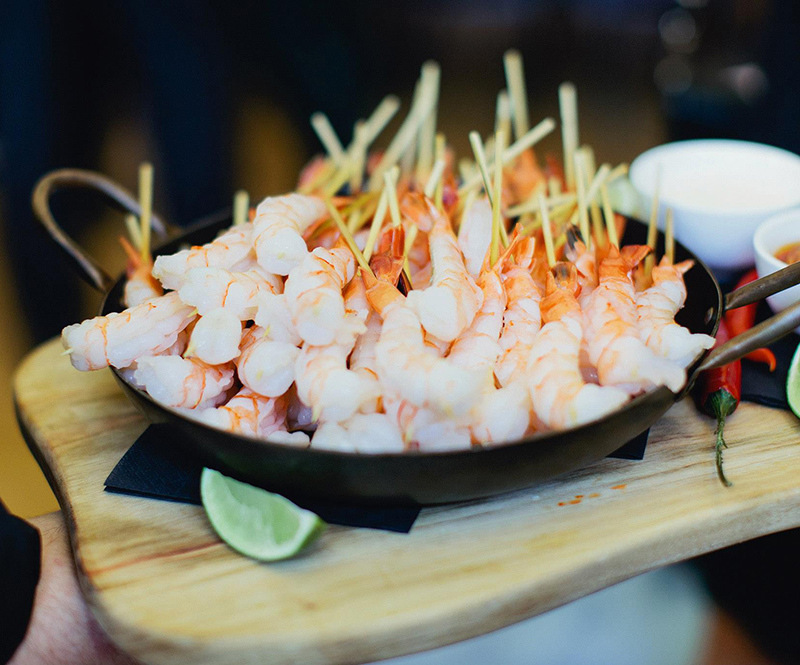 Going Gourmet remains at all times very aware of their clients’ requirements: we work together to achieve the right balance and impressions for your party, whether it’s an informal office celebration or a high profile event. 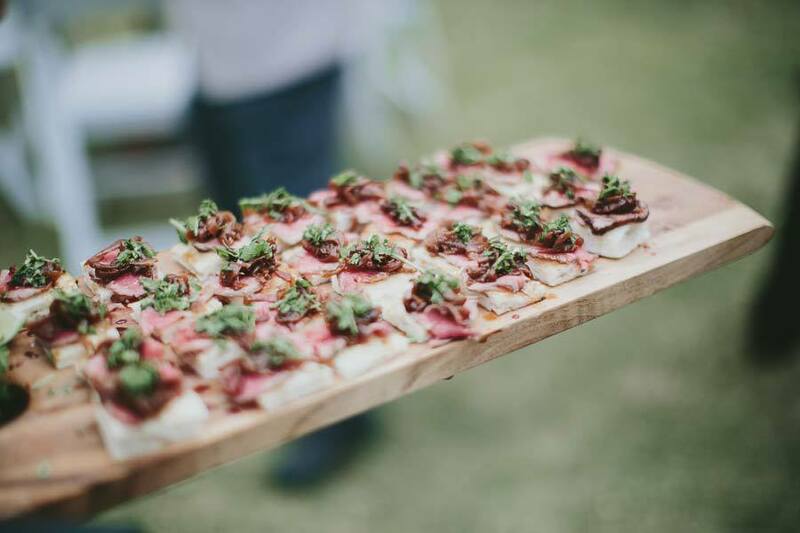 A fresh and flexible approach to event and food design means we are able to cater to your most specific needs for function and office catering service that complements the theme and tone of the overall event. Upon request, we will organise a consultation with our executive chef and tailor-make your menus. 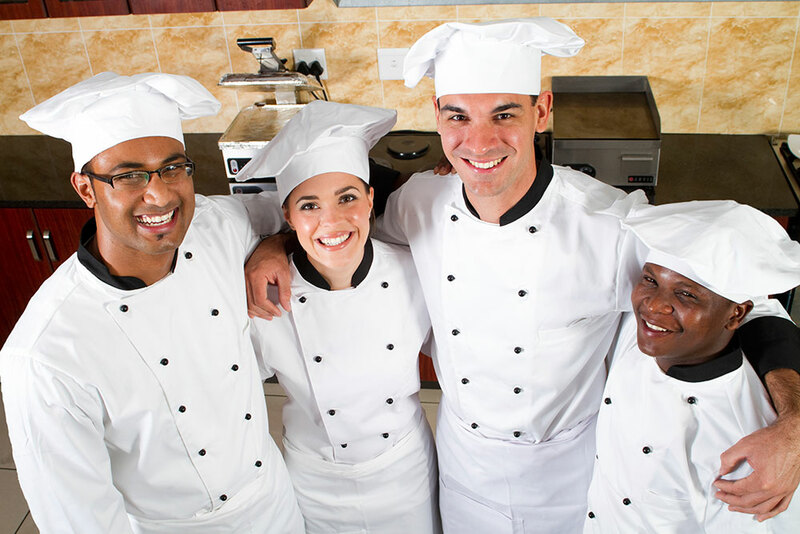 Our crew of experienced chefs and hospitality workers combines a broad range of skills to consistently deliver magnificent food that’s unmatched by competing office catering companies. Discover for yourself how we can make your next lunch meeting, conference or company celebration as memorable as possible; view the different menus below and get in touch on (03) 9543 8810 to discuss Melbourne corporate catering customised to suit your needs. 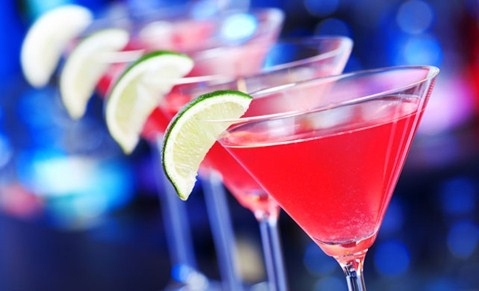 A classy cocktail party is a great way to make impression on colleagues, business partners, or just a select group of individuals that you need to socialise with. This particular format is a good mix of formality and the relaxed atmosphere that is perfect for communication. You can also add some special flavour that will make it perfect for your specific purpose. For example, including location-specific cocktails to celebrate some guests or setting a specific period for a dress code. However, you should never forget that cocktail party planning is a very complicated task. If you want everything to be perfect, you need to think every step through carefully and employ the assistance of a reliable catering company that can meet your needs. 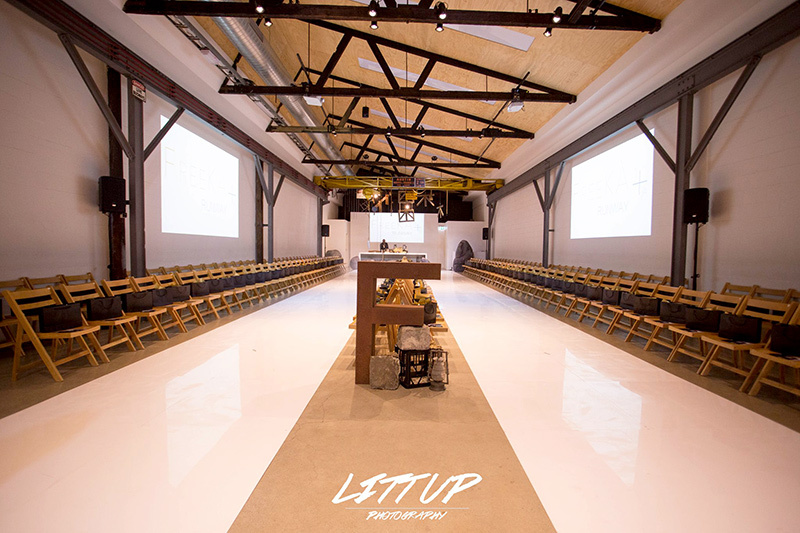 The exact steps you need to organise for an event like this are rather simple. The hard part is dedicating enough work and attention to each of them. Set the date. Do prior research to ensure that the guests you are most interested in can attend. The weekends are always the best choice so that people have a chance to sleep off their cocktails. Choose the venue. Pick a place that is easy for all guests to reach and that can accommodate the specific type of party you need. Prior bookings may affect your plans, so call early. Find a catering service. Hire a reliable company that can adapt to your requirements and have experience in serving these events specifically. They can provide you with a list of best cocktails for a party and provide a sampling to prove their skills. Be sure to research for any food sensitivities of the guests before making the final decision on the menu. Send out the invitations. Do this when everything else is arranged as you don’t want to re-send them if details need to be changed. There are three specific areas you must ensure are perfect for your party to be a success. They are food, cocktails, and entertainment. If these three are impeccable, even minor mishaps that might happen won’t dampen the guests’ enjoyment of the event. The catering service you choose will carry a huge amount of responsibility. You should make sure that the company can be trusted by studying their references and tasting all the food. In regards to entertainment, you should employ professionals. Note that a cocktail party is an event for socialising, so the program shouldn’t be the focus of it, instead providing a nice background to give the guests a topic for discussion. 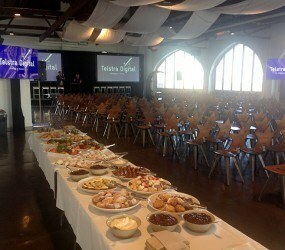 Planning a corporate party can be a challenge as there are many factors to consider. You must keep it professional, yet ensure that the atmosphere is friendly and relaxed. There is also the matter of the budget and impressions to be considered. For example, a celebratory party for your employees will be very different from the one you throw to impress potential business partners. Today, we’d like to share some corporate social event ideas that can work out in any situation. One thing you have to consider when you start deciding on a theme for your party is the type of corporate catering companies you can employ. 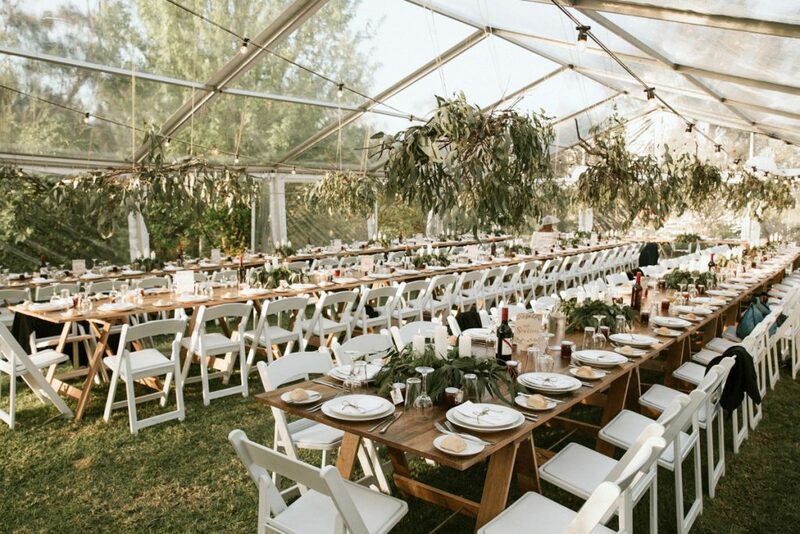 You need to find a service that will be able to adapt to your specific theme and enhance the party, while fitting within the limitations of your budget. 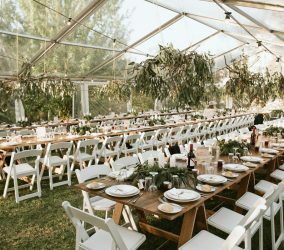 You can ask the service for advice when it comes to getting some theme ideas for events as they can make suggestions based on previous experience. Aviation theme. This event doesn’t have to be held on an actual plane, although adding a few decorations in this style will be perfect. Overall, this can be a rather simple yet sharp event with the serving staff dressed like flight attendants and the seating arranged to resemble a private jet. This is truly one of the best business party themes of all time. It’s great fun and can be made to fit any budget. It also allows for a measure of privacy for the employees, so it’s a great idea for events where you need to have people relaxed and happy. This, however, won’t be a good choice for a more formal occasion, such as signing a deal with new partners. Club party with a DJ. As informal corporate social event ideas go, this might be the best for young groups brimming with life and energy. Of course, you need to keep some degree of formality as it’s a business event, so it is best to have a simple catering package with buffet while a part of the venue is turned into a night club-like setting where people can relax and just enjoy dancing. Geographical themes. This is a rather good idea for celebrating the cultural diversity of your staff. You can have an event dedicated to every ethnic group. All it will take is clever setting decorations and a menu that includes local delicacies. Catering for an event is a job that requires a lot of skill, high level of responsibility, and the use of top-quality resources. 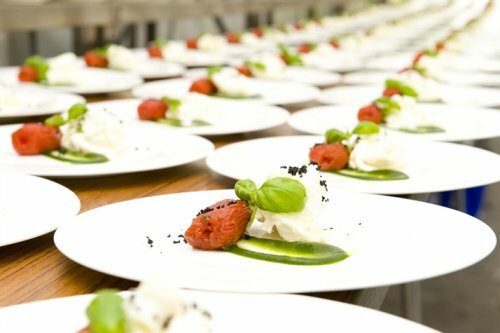 Therefore, when looking for affordable catering services in Melbourne, you should know exactly what makes this kind of company reliable. Studying the menu and tasting dishes doesn’t provide all the information you need in order to determine whether you should put your trust in these people. Flexibility and adaptability. 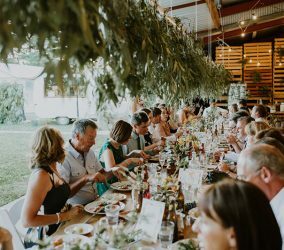 Every event is unique, and a caterer must account for this in order to ensure everything goes perfectly. Of course, companies offer special packages for different types of events as this is more convenient for business. However, a reliable catering company will be willing and able to adjust their package to meet your specific needs. They must also show that they understand how best to adapt to your requirements. For example, if you are looking for affordable catering services and need a gluten-free menu, a good company will start by pointing out gluten-free options in their current menu. This is cheaper and more efficient than developing a new menu from scratch and shows that the business is concerned with the customer satisfaction and not only the money. Food safety. Surprisingly, most people focus only on the taste of food and look of the serving when they employ a catering company, without investigating the matter of food safety. This is unacceptable risk as any breach in the necessary procedures can lead to a tragedy. 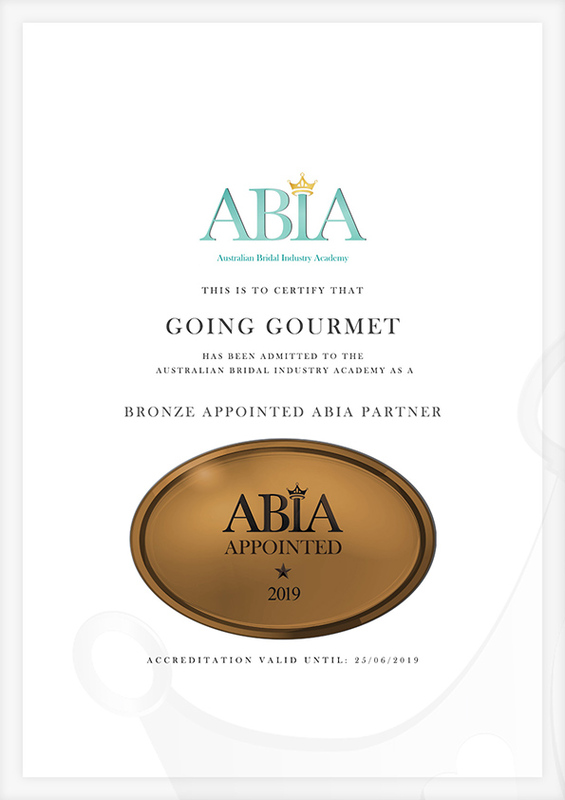 A reliable caterer will provide you with proof of the quality of their food, such as certificates and information on the produce origin. Having a great team of cooks and well-dressed servers doesn’t necessarily mean that the catering service as a whole is successful. There are a great many people involved in catering for an event, and they must all work smoothly together. In essence, this company must run like clockwork, and you can estimate their skill in this by observing the operation when you discuss the terms and plans. Be sure to study the company’s references as any issues caused by poor management are sure to be noticed. Financial planning. The caterer must work within the strictly set budget and they must make the best use of your money. Discuss all financial details beforehand and request a full breakdown of costs so that you can understand where exactly your money goes. Planning events, especially big ones, can be a daunting and stressful affair. 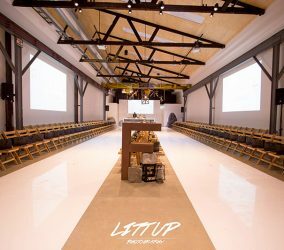 Having to manage event planners, coordinators, decorators and more is a difficult juggling act, so it is understandable that things can get a little bit tense. Thankfully, most of these people will be professionals that are more than capable of working on their own initiative once you get them started. When it comes to catering, there are a lot of things that need to be thought out and discussed. Picking the right dishes, for example, can make or break the success of your planned event. The best way to make sure everything is spot on is to put a little faith in your caterers. 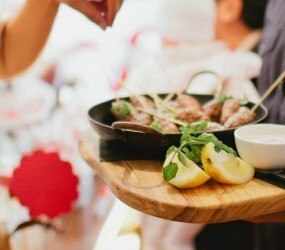 This post hopes to help you do that by offering some tips that will let you get the most out of your catering staff. Communicating what you want and expect from your catering company is really important. Similarly, they should be speaking with you to confirm meals, dates and numbers. Sometimes, an email might not be the best bet – try picking up the phone to cultivate instant responses. Be honest, open and receptive in your dealings with catering companies, from pricing to plating. It is the easiest way to help the catering company do their job to your expectation. There are lots of ways to look at how well reviewed a catering company is these days, especially online. Whether you use Yelp or look at their social media feeds, you can really learn a lot about a company through reviews. 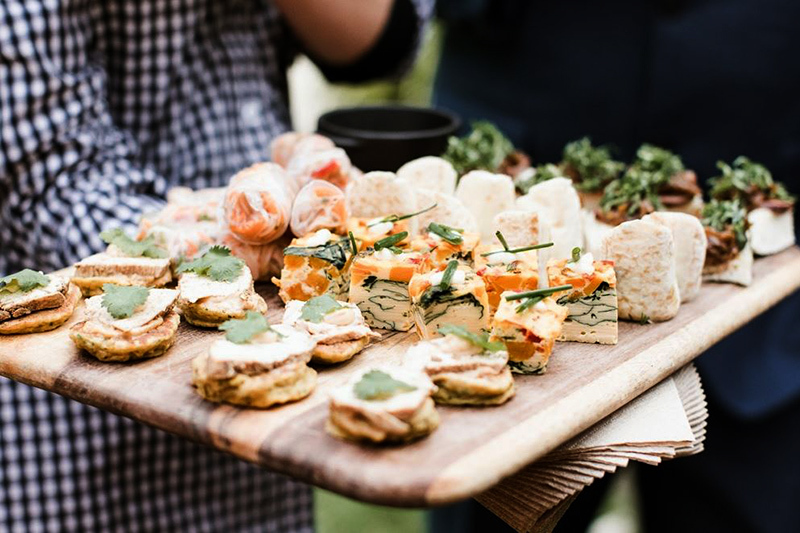 Word of mouth is another great way to vet your potential caterers – so listen to any friends or family when they mention a good catering company. 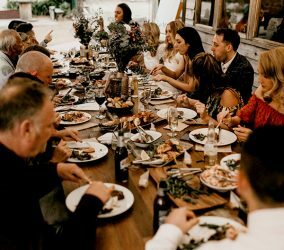 There are usually two main concerns or questions that you will ask a caterer – how much will it cost and can you cater to all of my guests needs? Although these are important things to ask about, you should really dig deeper. Will they provide a full service, or is it a drop-off catering company? Do they have any signature dishes? What about the alcohol? Try to think about the specifics so that you know the exact service they will provide. When you get to the tasting, think about your expectations before trying the food. Then consider how they stacked up after sampling their offerings. Try not to be too critical, but be honest about your expectations. If you are not fond of the wine or think the food is too much, now is the best time to mention it. Looking for a dining experience that is casual and social, without compromising on the quality of the food? Then our gourmet BBQ catering is for you. Our chefs and staff will put on a tantalising display on the barbecue in front of you and your guests. Our Melbourne based team of chefs use only the freshest ingredients and butcher all our meats, go to market for specialty seafood, and prepare all sides and menu items. As delicious as barbecues are, it is very time consuming to buy, prepare and cook all that food. It takes away from time you would rather spend catching up with your friends and relatives, and we don’t blame you. If you let us take over all the cooking duties, you can relax and enjoy yourself. Barbecues are a great, casual way to entertain whilst you mingle with friends or even business associates. Once your mouth watering package is cooked to perfection, you will be invited to dine with the BBQ Buffet. Our gourmet BBQ catering is presented in beautiful polished stainless steel bain-maries. These keep the barbecued items at optimal temperature. Your chosen selection of hot and cool sides are then presented to complement the main buffet, with sauces and condiments alike. It provides great entertainment, delicious food and a day to remember. This gourmet BBQ catering package will ensure that our first class chefs and wait staff will be there to cook all the excellent food and provide your guests with excellent service. We will provide all the plates, napkins, cutlery, platters and bain-marie equipment so you will not have to do a thing. There is no extra cost, and you and your guests will enjoy yourselves all the more for it. 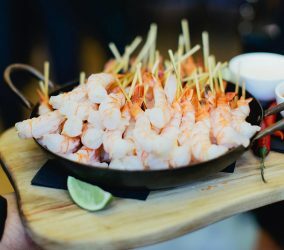 Our fabulous cocktail BBQ menu will allow you to add Canapés to the food already being provided. The wait staff will serve the Canapés in order, and add extra classiness to your BBQ. Barbecues are popular throughout Australia, and with good reason. 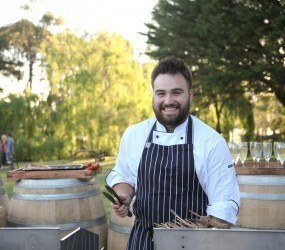 We love that we get to give the people of Melbourne the best gourmet BBQ catering service around. 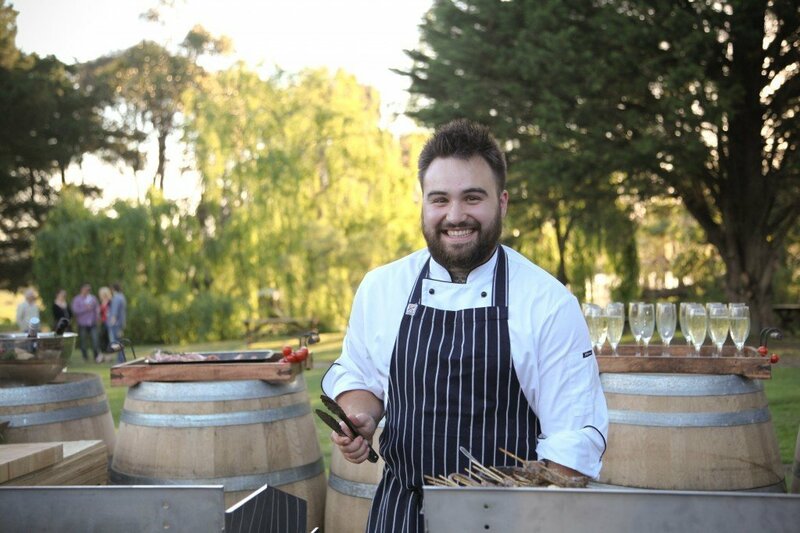 If you would love to treat your guests to some lovely snags and steaks, then please call us at (03) 9543 8810 or flick us an email and we will start preparing. Many people may not have heard of Kombucha before, but this beverage is the latest organic drink to take health conscious eating by storm. In fact, despite its recent rise as a popular health drink, Kombucha has been around for thousands of years and the names it has gathered along the way suggest there is some benefit to adding it to your daily diet. The drink is made by fermenting tea and sugar with a culture, making its health benefits many and varied. 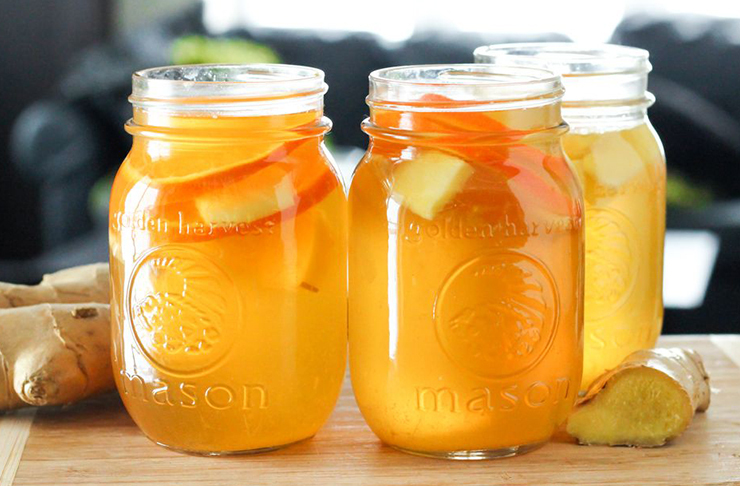 Kombucha is made by fermenting green or black tea along with sugar and a Kombucha culture. The culture is called a “symbiotic culture of bacteria and yeast,” or ‘SCOBY’ and the resulting drink after fermentation can be described as tasting like sparkling apple cider or champagne depending on the type of tea used. A Kombucha culture looks like a beige rubbery pancake and its qualities turn sweet tea into a drink that is full of health-improving organic acids, enzymes, vitamins and minerals. Described as the “Tea of Immortality” during Tsin Dynasty in China, Kombucha has also been referred to by different cultures as “the immortal health elixir”, suggesting its benefits are genuine and real. Benefits of drinking Kombucha include assisting our body’s digestive system, detoxification, improved energy, immune health and joint care. The drink has also undergone various tests and studies that have shown it to have antiviral, antibiotic and anti fungal properties. Many people who have been using Kombucha over a long period of time report benefits such as improved energy levels and relief of chronic fatigue, digestive problems, allergies plus many more. The key to the drinks’ many and varied health properties seems to lie in the sheer number of good bacteria found in it. This unique mix includes everything from pro-biotics, anti-oxidants, vitamins and glucosamine. In addition, the beverage can also be easily made at home although great care should be taken to avoid contamination. As if that wasn’t enough, this amazing organic drink has also been found to improve your metabolism and limit the accumulation of fat, thereby assisting with weight loss. Studies have suggested that consuming the glucaric acid found in the drink could also help to reduce the risk of cancer in humans or help recovering patients. In some parts of the world, this unique organic drink is also used externally to treat skin problems or as a hair wash solution. With the health benefits mentioned above proof of how regular consumption can improve our health, Kombucha is the latest organic drink sensation for good reason and well worth a try! Birthdays only show their face once a year, so it’s always nice to create a memorable celebration for your friends and family when their turn arrives. However, there is often an expectation for birthday parties to be a flamboyant, grand gesture involving petting zoos, hot air balloons and a monstrously large cake. Needless to say, parties do not need to be so grandiose. There are definitely plenty of opportunities for low-key, high-value celebrations, particularly if they are being shared with your close family and friends. This post offers up some fantastic ideas for a low-key birthday party that is perfect for your loved ones. There are some activities that are timelessly fun and rewarding. Piñatas fit this mould perfectly, and are often overlooked as a great centrepiece for an amazing birthday party. If you want to try a different take on things, try setting up a separate piñata just for the adults. There is something inherently entertaining about a grown man or woman flailing a brightly coloured stick at a papier-mâché donkey in a bid for candy. If the weather is a little too hot or cold outside, then seek some sanctuary indoors and chill out to a movie session. Get yourself some big bowls of popcorn at the ready, find something that everyone will enjoy and settle in for a night of sumptuous screen indulgence. If all goes well, expect a movie marathon to take hold by the end of the night. If the weather permits, there is no better way to appreciate the company of friends and family than around a table on a warm summer’s day. To add a little something extra, why not bring some of your indoor furniture outside? The sense of comfort coupled with the perfect weather and a tantalising spread of food makes for a truly memorable birthday experience. If your low-key party makes its way into the twilight hours of the evening, then keep the fun outside. Illuminate your outdoor area with a wave of tactically-placed tea-candles to create a classy, ambient atmosphere where you can chill out with your friends and family. 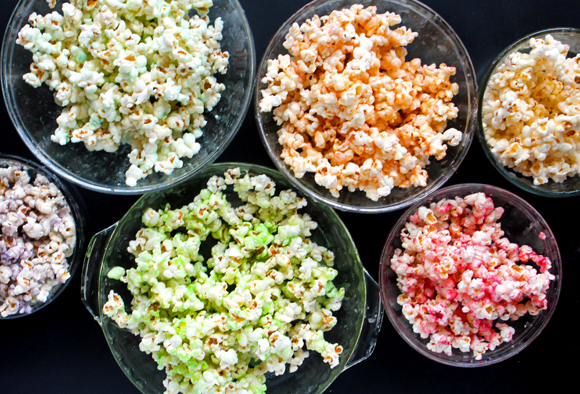 Why not try your hand at creating a variety of different flavours of popcorn? This new trend has allowed for some very unique variations of popcorn – from traditional caramel corn to an elegant rosemary/sea salt blend. You can further spruce up your experimental kernels with the right containers – look for classic, old-fashioned movie bags, or if you are feeling particularly classy, try source some old apothecary jars and fill them with your popcorn. Nowadays people are starting to take a good, hard look at what they eat, which has resulted in a surge of vegetarian, vegan and gluten-free diets to consider when catering. Thankfully, almost every menu these days will cater to the needs of the thoughtful eater. However, there is still a stigma that menus for these guests is either going to be expensive or bland in flavour. These myths could not be further from the truth, as this post illustrates. Caterers are incredibly versatile when it comes to designing a menu, especially when creating something suitable for everyone. Better yet, there are now a range of different options that are inexpensive and delicious. Before diving into some of the ingredients and ideas for vegetarian and vegan recipes, there are a few tips to consider that can cut the cost of your dishes. For starters, do not feel that you have to go organic with all of your ingredients. Look at some of the least contaminable ingredients, such as onions, asparagus and bananas, then buy the less expensive, non-organic stuff. There are a few items that you should buy organic though, such as peaches, lettuce and bell peppers, as they are more likely to be contaminated. One of the biggest vegetarian trends to hit catering in the past year is the rise of Southeast Asian cuisine. These dishes are loaded with fresh flavour, spice and vibrant colour that is sure to titillate any guest’s tastebuds. These kinds of meals tend to be packed with quinoa, rice, eggplant, beans and tofu. Don’t forget the spices, either! Creating a gluten-free menu can end up costing a small fortune if you let it run wild, particularly if you resort to using pre-made, gluten-free products (especially in baked goods). What’s worse, most of the gluten-free products lack taste, leaving guests feeling disappointed. Hence, it is always best to start from scratch with a gluten-free menu, instead of shoehorning a menu to fit the mould of gluten-free. One of the best tricks to keep the prices down is to focus your recipes around naturally gluten-free produce. Things like eggs, seafood, rice and corn naturally have no gluten in them, so using these ingredients will help steer you in the direction of an inexpensive, gluten-free menu. Salads are a great option for catering, or for canapes you might want to look into gluten-free bruschetta. By pocketing away these handy tips, the idea of crafting a diet-friendly menu becomes far less daunting and much more enticing. Looking to host an unforgettable function? For weddings, birthdays, conferences and more, we’ll work with you to plan the perfect event with cuisine that will have your guests impressed.